The Upper Austrian flutist Karin Bonelli, born in 1988, may already look back on a manifold musical occupation. After years of apprenticeship in her hometown Grieskirchen and as a pre-student at the Bruckner University Linz with Gisela Mashayekhi-Beer, she changed to Vienna into the class of Prof. Wolfgang Schulz at the University of Music and Performing Arts. After additional lessons with Günter Voglmayr and Philippe Boucly, Karin Bonelli became a student of Karl-Hein Schütz at the Konservatorium Wien Private University, where she - after a year abroad at the CNSMD Lyon/France with Philippe Bernold - completed her studies as a Bachelor of Arts with distinction. Besides her studies Bonelli received also important influences by Andrea Lieberknecht, Paul Meisen, Julien Beaudiment and Peter-Lukas Graf. As a soloist Karin Bonelli won already several prizes, such as the KIWANIS cultural prize, the sponsorship prize of the Lions Club Nibelungen or four times the First National Prize of the Austrian music competition “Prima la musica”. During her studies Bonelli discovered also her passion for the orchestra, as numerous engagements prove, e.g. at the Tonkünstler Orchester Niederösterreich, Orchestre National de France in Paris, Opéra National de Lyon, Wiener Symphoniker or the Vienna State Opera. 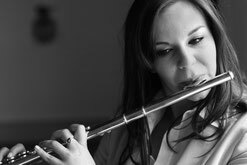 Since September 2012 Karin Bonelli is engaged as a second flute at the Vienna State Opera Orchestra/Wiener Philharmoniker, as the first female wind player in the long and rich history of this famous ensemble.